Love In the Language of Yarn and Education : A Little Reminder! The squares in our blankets are lovingly made by adults and children from all walks of life and many different countries around the wold. The blankets provide love, a sense of security, warmth and comfort to Syrian refugee children who have been made homeless by war, and will send a message of concern and hope. Your participation is important in sending this message of hope, the thought that someone cares, and that this beautiful, handmade blanket was created especially for them. It doesn't really matter what it looks like: even the most basic knitted blanket patterns will yield perfect results – a smile. I'm asking for 8" x 8" (20cms x 20cms) Knitted or Crocheted Squares. Any Design, Any Colour, but Straight Edge please. Acrylic if possible (or whatever you have in your stash!) No deadline, no panic, no rush. So I can acknowledge receipt of your Squares please. 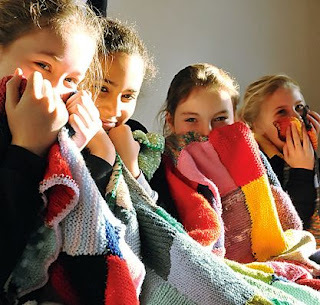 We work with reputable, experienced relief agencies to securely transport and distribute our hand-knit and crocheted blankets for this progect we are working with Humanitarian Relief Foundation.